Soulful Blues that crosses Oceans. Even with nine studio album’s under her belt; I’m pretty sure that Erja Lyytinen’s name will be new to just about everyone reading this review as she is from Finland, and not the more common homes of the Blues. Recorded at the legendary 100 Club in London Town; this Live album goes some way to showcasing Lyytinen’s back catalogue as well as her skills on the electric guitar and her extraordinary voice. The album opens with the short and sweet Gospel song It’s a Blessing and Erja’s deep, throaty voice certainly catches the attention; but when the guitars kick in at the beginning of second track Let It Shine you know you are hearing something very special indeed. Blues music comes in many shades; and even though Erja plays a mean and dirty guitar at times; her voice is more suited to the slower soulful end of the spectrum; as Grip of the Blues and Hold on Together both prove from start to finish. The mix of Erja’s cool voice and superb guitar skills never sound better than on her 7 minute homage to Elmore James’ The Sky is Crying which owes a lot to early Eric Clapton or possibly Roy Buchanan, in its deceptive simplicity. Four Elmore James cuts are included and the album ends with a fourteen minute sashaying Dust My Broom; which used to be a staple of every Blues band in my youth; but I’d not heard it for years and had forgot what a great song it is and Lyytinen’s sweeping guitar flourishes amidst a very tight rhythm section are extraordinarily brilliant at times. As a taster this Live album works and has whetted my appetite for her studio albums and indeed the opportunity to see her in concert. 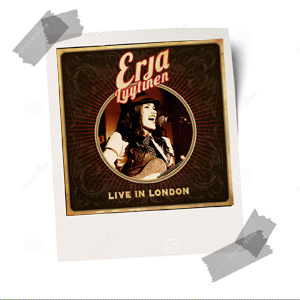 #Irony corner – I will be in Finland the weekend Erja Lyytinen plays my home town of Durham, England!